People choose to compete in the discipline of dressage for many reasons. Some because they have a natural talent for such a sport. Others do it because they feel they don’t have the confidence to jump. There is also the great influence from the likes of Charlotte Dujardin and Valegro, which may have inspired some to gather up their reins and take on the world of dressage. Watching such inspirational equestrians perform can make many want to take up the sport. But if you’re new to dressage where do you begin? Where do you start with training, attire or even competing? Dressage takes great skill from both horse and rider and has been described by many as ‘poetry in motion’. Many of us were glued to our TV screens when the Queen of Dressage, Charlotte Dujardin and her striking ride Valegro competed in the 2012 London Olympic Games. Charlotte not only took home a Gold Medal in the team dressage, where she broke the Olympic record, but she and Valegro also secured an individual Gold Medal. The superstar pair, then managed to retain their individual title in Rio at the 2016 Olympic Games. While Dujardin and Valegro are a good poster for the discipline. You don’t have to dive right in at their level. The best way to get into dressage is to build yourself up slowly. Trust me it’s not as daunting as you might think. 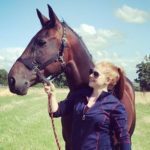 Below I have highlighted a few tips to take on board if you are new to dressage and looking to break yourself in gently. Get yourself a good instructor. Handling a half ton animal is hard enough without having to teach yourself and him the basics first. By having one weekly or fortnightly lesson your riding and way of going can really improve. There is quite a difference in position from most of the other equestrian disciplines, and while the basics are fairly common, you will have to make a few alterations if you are moving from one discipline to the other. You will ride with a straighter, longer leg and you will be encouraged to sit tall. You will also have to engage your abdominals quite a bit more. Although most horse riders I know have muscles of steel, dressage riders always seem to have impressive core muscles. So, it is an idea to work out a fitness regime for yourself. Do check out our blog on Rider Fitness. Tack and clothing. Now, I would probably have to write an entirely different blog just to cover everything, but the basics are, if you have particularly ‘blingy’ clothing and tack, its best to leave that at home. The odd bits are fine, many people compete with a sparkle on their brow band, but it is best not to compete in your bright shirt and pink reins. White, beige or cream gloves are preferred as well as white jodhpurs. Don’t feel like you must dive right in at the deep end. There are plenty of great smaller events out there that you can head to, building up your confidence. If you are nervous or unsure, dressage offers a range of levels including Intro at just a walk and trot. If the time comes and you feel ready to affiliate, the jump is not as big or as daunting as you might think. Affiliating to a Dressage organization is just like joining a team or a club. They will support you and assist you if ever you need it. You’ll most likely find a number affiliated series near to you, which allow for gradual progression and for you to dip your toe in the water. I hope the above gives you some starting pointers. I hope to see all you great Charlotte Dujardins and your Valegros at my next dressage competition. Happy riding. A Royal Agricultural University graduate, having studied International Equine & Agricultural Business Management. Niamh is an aspiring journalist, primarily she enjoys writing about the equine world but can turn her pen to anything she finds inspiration from.